I LOVE all the cheap, fresh herbs available here! You can get huge bunches of just about everything for a little over a dollar. Amazing. It’s going to be hard to go home to my pantry full of dried herbs and spices after this. As per usual, I’ve combined a bunch of recipes into one here. One of the nicest things about this recipe is that it doesn’t have any cheese (and you really don’t miss it). All the white pieces in the photo are toasted bits of blanched almonds. To blanch the almonds, place them in a small saucepan. Bring a cup of water to a boil and pout it over the almonds. Let them sit for a minute, then drain and rinse with cold water. Wipe the skin off the almonds. * Optional: chop the blanched almonds in the food processor, then toast over medium heat in a skillet. This enhances the flavor and makes them prettier. 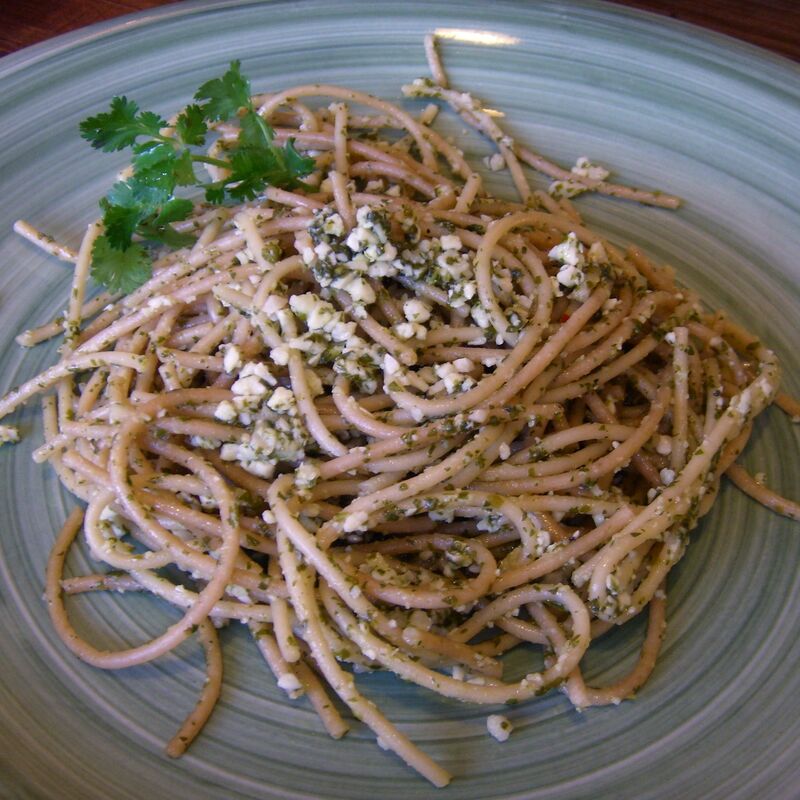 Mix up the pesto: Blend the almonds and garlic in a food processor until they’re nicely chopped up/ pulverized. Add cilantro and pulse until chopped down. Then process remaining ingredients and season to taste. You may need to add extra olive oil or lime juice.